Find someone to feed the cats while you’re away, pack those Hello Kitty bags and let’s take one epic trip around the world for a feline fix. Read also: The one-eyed surfing cat in Hawaii. Is that Hello Kitty dating Hello Kitty? What’s going on? What goes on: No one does cat fever quite like Japan, so let’s start at the wold-famous Sanrio Puroland. A huge parade is thrown everyday that attracts 1.5 million visitors each year. Hello Kitty’s friend, Cinnamoroll (dunno, never heard of this one either) guides visitors around the park. There are rides, a kind of dance performance at night, and Hello Kitty’s “home”. Extra: Tokyo has more than a hundred cat cafes. If you don’t mind a few cat hairs in your latte, get cosy with a couple of local kitties at places like Cateriam in Shimokitazawa and Curl Up Cafe in Haramachi. What goes on: Don’t fly out of Japan just yet, you haven’t been to the human-outnumbered cat island of Tashirojima! Seriously, there are only about 86 humans and more than 100 cats. The original residents on the island raised silkworms, and brought in an army of cats to deal with the consequential mice problem. The cats then decided to stay for good, because that’s such a cat thing to do. What goes on: The sanctuary sits on the Herengracht canal and was made in 1966 by Henriette van Weelde, a fellow crazy cat lady. She would adopt strays and decided that they needed a permanent houseboat, much like a free hotel… except they don’t need to check-out. Visitors can come just to “aww”, but why not stay to help out, donate funds or even adopt? Extra: Visit the Kattenkabinet museum for all things cats; painting, artifacts, furniture and a gift shop. Weirdly though cats aren’t allowed inside, but they do have a few resident cats. What goes on: You should take a trip to Greece regardless — the beaches, clean white architecture, parties, and yes, cats! And so many of them! Chora is where the felines seem to flock to. They’ve really taken to the laidback island vibes; you’ll find them hanging about cafes and taking cat naps on comfy corners. What goes on: Meet the swankiest New Yorker; Matilda the Algonquin cat. She’s the hotel’s proud mascot and you can even send her fan mail to matildaalgonquincat@algonquinhotel.com. There was a bit of trouble in 2011 when the Department of Health raised hygiene concerns (what is this, a cat cafe in Tokyo?) but Matilda is a cat and could care less — now she just wears a vibrating collar that keeps her away from the kitchen. What goes on: If you love cats, you might spend lots of time at home reading (we say this with love). So if you’re a fan of classics and Ernest Hemingway, head to Hemingway Home and Museum. What’s truly magnificent about this place is that it’s home to 40 to 50 cats with the polydactal gene, which means half of the cats or so have six toes. Hemingway had his own six-toed feline named Snow White and some of the cats there are her descendants. He named all of his cats after famous people and the tradition still stands. 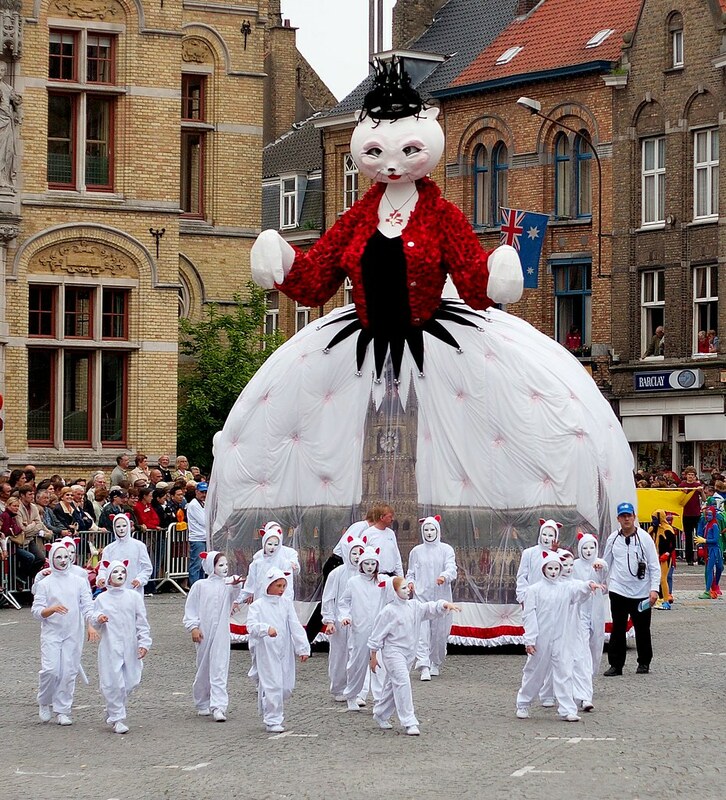 What goes on: Locals get dressed in their cattiest of cat costumes (some even dressed at witches and mice), put on a huge show and parade giant cat floats. The highlight is when a jester tosses toy cats (key word: TOY) from the Cloth Hall bell tower down to the children below. This tradition dates back to when locals would throw actual cats from bell tower. Luckily they’re crazy about cats now. The festival is held every three years in the month of May. Unfortunately you just missed the last one in 2015 but there’s always a next time! What goes on: The sanctuary’s aim is to “work together to raise the quality of life of Rome’s abandoned cats”. So while you’re here, expect to get down and dirty. Visitors can help clean cages and feed the cats, but if you live in Rome itself you can adopt the cats too. The 300 stray cats are pretty content to roam about (Rome about!) the ruins but remember, every responsible owner knows the importance of giving cats plenty of love, a clean home and catnip. Photo credits: Main, 1, 2, 3, 4, 5, 6, 7 and 8.